size of a jellybean weighing only 2gm. * All photos are copyright and may not be reproduced without permission. 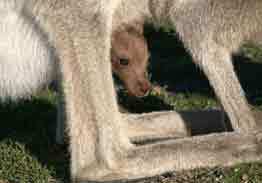 A female Eastern Grey kangaroo gives birth to a tiny joey that weighs about 2gm and is the size of a jellybean. 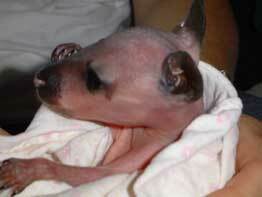 It is pink, hairless and its eyes are closed. 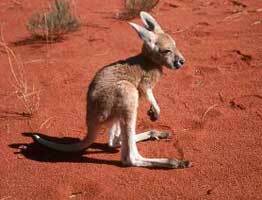 Before the birth, the mother kangaroo licks her fur to make a track so that the joey can climb up into her pouch. It's a long way for the newborn to climb using its small front legs. 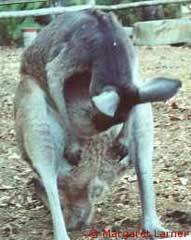 When it arrives safely, the joey attaches itself to a teat. The little joey stays attached to the teat drinking milk for several months. As it grows and develops, it also starts to grow fine fur. After a few months its eyes open. Soon it is able to let go of the teat and look out of the pouch at the world its mother lives in. It also starts to nibble grass. 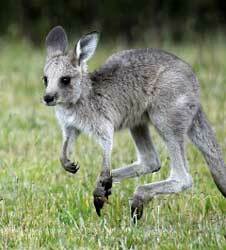 By the time the joey is about 8 months old it is able to leave the pouch and stand on its own. This sometimes happens when the mother is lying down. She relaxes the muscles that control the pouch and the joey tumbles out then hops back in again. Over the next few months the joey will spend more time out of the pouch. It will practise skills like hopping and jumping. It also learns what to eat but will still come back sometimes and put its head into the mother's pouch to have a drink. By the time the joey is about 10 months old, it is too big for the pouch and stays out all the time, sometimes straying away from its mother to explore. The mother will call to her joey if it strays away too far or the joey will call for its mother if it gets lost. 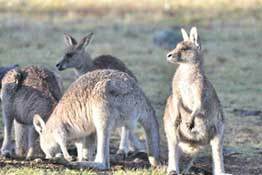 The joey gradually becomes more independent of its mother and learns to be part of the mob. Image © Ludo Kuiper From the time when the joey first enters the pouch until it becomes independent, the mother changes her milk several times to give the joey the nourishment it needs at different stages of its growth. When she gives birth to a joey, she can cleverly produce milk in one teat for the new joey and also produce another type of milk for her older at-foot joey who only comes back occasionally to drink from another teat in her pouch. Joeys come into care for a number of different reasons: bushfire, drought, the mother is hit by a car or shot or chased by motorbike riders or dogs. When a joey comes into care, the wildlife carer has to keep the joey at the same termperature as it would be in the mother's pouch. It will need more warmth if it is unfurred. The carer then has to work out how old the joey is. 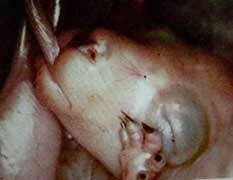 This is done by observation and measuring its feet and tail. 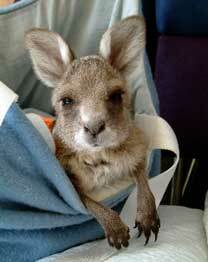 The carer makes a pouch for the joey to keep it warm and quiet and safe. 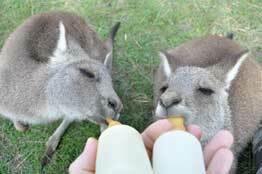 Each day the carer feeds the joey special kangaroo milk formula using a small bottle and teat. The joey must be fed, kept warm and clean just as the mother would do. The amount and type of formula it is given depends on the age of the joey. It must be the right type of milk and the right amount for the joey to grow and be healthy. The carer must look after the joey and do what the mother kangaroo would do. 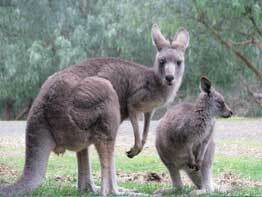 When the joey is old enough, the carer takes it outside to look around outside its pouch and to nibble the grass. pouch and back in again. 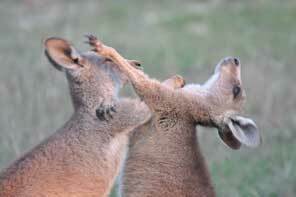 When the joey is older then it is encouraged to eat more grass and to practise hopping and jumping with other joeys. 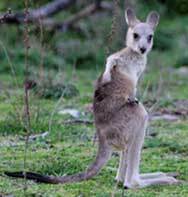 By the time the joey is 10 months old it will not need a pouch any more. 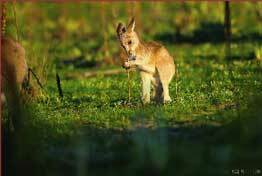 It will sleep and eat and exercise with the other joeys and will gradually not need a bottle because it is eating a lot of grass. It now spends very little time with its human carer. When the joey becomes independant and ready for release with a little group, then it should be able to look after itself and be ready to join a small kangaroo mob. Image © Ludo Kuiper From the time when the orphaned joey first comes into care until it becomes independent, the wildlife carer must use a different milk formula at different stages of the joey's development (just as the mother kangaroo would do) to give the joey the nourishment it needs at different stages of its growth.